The Rebel Sweetheart. 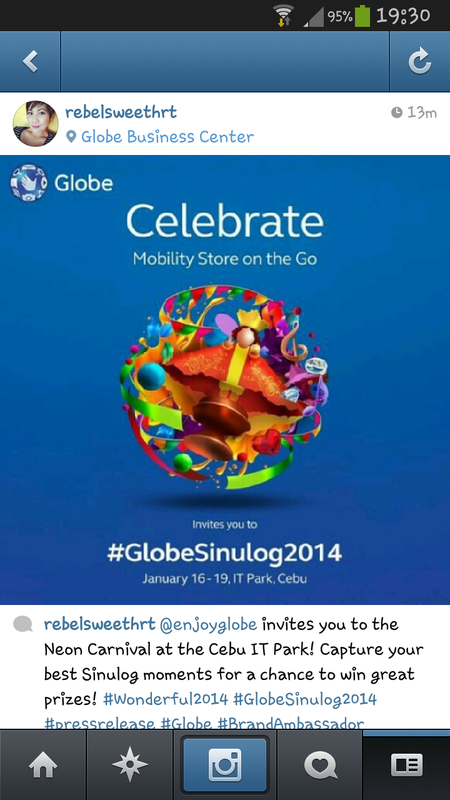 : Sinulog 2014 goes digital with Globe Telecom. If you're in Cebu right now to join the festivities of the annual Sinulog Festival, I have some great news for you! With the advent of digital technology, Globe Telecom makes its presence felt at the Sinulog Festival in Cebu from January 16-19, 2014 by harnessing social media to showcase the vibrant and lively celebration to the rest of the world. This year, the leading telecommunications company turns to social networking sites Instagram and Twitter to engage locals and tourists participating in one of the country’s biggest and most attended festivals with a photo submission contest. To join the contest, Sinulog attendees should capture and upload photos taken from the Globe Neon Carnival on Instagram and Twitter with the hashtags #Wonderful2014 and #GlobeSinulog2014. The photos must tell the story of “Globe creating a wonderful world of festivals and celebrations at the Sinulog 2014”. Five winners of Globe prepaid load cards plus 1 grand winner of P5,000 worth of prizes from Globe Telecom’s mass market brand TM will be awarded daily during the 4-day event. Located at Block 11 Cebu IT Park, Apas in Cebu City, the Globe Neon Carnival is a village-like attraction that houses the Globe Mobility Store-on-the-Go, a one-stop shop showcasing the telco’s line-up of prepaid, postpaid and Tattoo broadband offers as well as exclusive Sinulog deals for subscribers to enjoy. Aside from the roving Globe Store, the Globe Neon Carnival also features food carts and drinks stations, interactive game booths, and exciting prizes for lucky locals and tourists. Entertainment acts from blacklight dancers, local bands, and local and international DJs are expected to provide the fanfare at the event. One of the highlights of the Globe Neon Carnival is the “Kaloka-like” contest, a concept that originated from a noontime show open to the public. Participants are to showcase their looks and talents to convince the crowd and the judges that they deserve to win the title. Three (3) celebrities composed of an international singer, a primetime TV queen, and a men’s magazine model will form the panel of judges. In addition, a daily raffle will be open to subscribers who will avail of Globe Prepaid, Postpaid and Tattoo offers, with exciting prizes such as tablets, handsets, and gift certificates from partner-establishments. “We invite both the locals and tourists attending the Sinulog Festival to ready their smartphones and take photos from the Globe Neon Carnival to be part of this year’s biggest Sinulog social media craze courtesy of Globe as we experience a brand new Globe network in Cebu. With a quick snapshot of the energy-filled festival celebration in Cebu, you can win prizes by showing to the whole world, via social media, that it’s really more fun in the Philippines,” said Globe Retail Transformation and Management Head Joe Caliro. Open daily from 4:00PM until the wee hours of the morning the next day, the four-day event is open to the public for free but Globe subscribers will be greeted with a slew of food treats and freebies upon entry. To know more about #GlobeSinulog2014, follow @enjoyGLOBE on Twitter and like Globe Telecom on Facebook at www.facebook.com/globeph.